I'll be honest, I don't have much to say about this weekend. I am not too pleased with how the football game ended yesterday. It is really difficult to get into it during a loosing season...and think of how much money I spend on those tickets! Friday I took Eliza to open gymnastics at a near by gym. It is for children under the age of 4 and they are allowed to just run around and do whatever they want. Eliza's friend from dance came as well. She had a blast with her, if they would get separated Eliza would ask "where is she?" and call for her. I am loving that she is starting to have friends. I'll be honest, Saturday is a blur. Eliza slept in until 10!!! When Mark and I realized it was 10 we were shocked. It was so nice to sleep in though. We lounged around for a while and then realized it was 1...we really did nothing. Eliza laid down and I went and ran some errands. I am excited that we found some educational games for Eliza to play on the iPad, she does a great job. I want to get her some sort of learning tablet for Christmas this year. Sunday I got up bright and early to get ready. We got to Church and Eliza was a bit hesitant to go in, I had to stay in the nursery with her a bit. I feel terrible when she is scared like that. Luckily her teacher Debi is the BEST with her and was able to get her calmed down and distracted for me to head into service. After Church I had to head to the game...we will leave that at that. That's about that. Pretty lazy weekend here. Hopefully our week is a little more exciting. 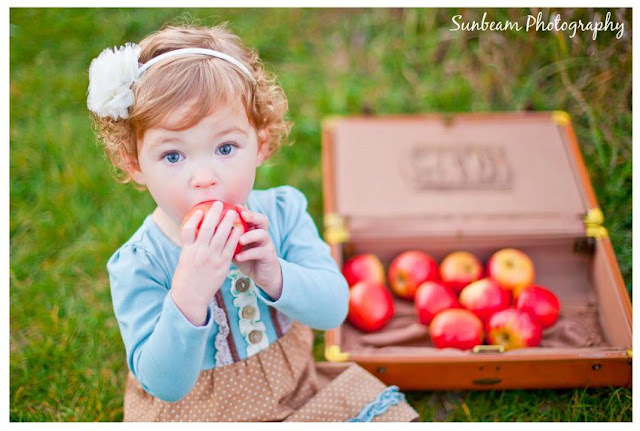 We are headed to the apple orchard today, it is all Eliza can talk about after playing with those apples in her pictures! !